The wet felting technique we use is a process of laying out combed or carded fibers of wool either in the ultimate shape for their use or as a sheet of fabric later to be sewn into a garment. 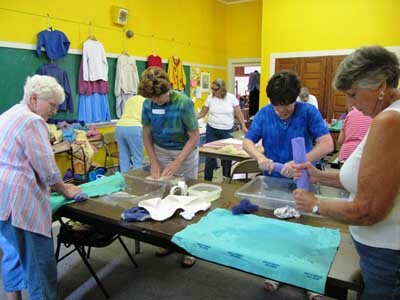 Felting is using hot water, soap and agitation to change the raw fibers into a fabric. Each fiber of wool contains numerous barbs that bind to each other or find their way through the weave of other fabric materials. The number of layers is determined by the design. In some cases, only one or two layers are used to produce a very fine and lace-like fabric we call cobweb lace. For heavier fabrics, multiple layers of wool roving are crisscrossed and combined with silk, bamboo, Tencel, cotton and synthetics. After all the layers of wool and other fibers have been laid out, a solution of soapy water is applied. The design is laid on a bubble-wrap like surface, rolled up and agitated for long periods of time. The barbs, which naturally occur in the wool fibers, combine or lock, creating a fabric. Needle felting uses a special barbed needle or array of needles to join the wool fibers to other fabrics or fibers .